The fate of popular China-based English-language lifestyle publication City Weekend and its sister sites Shanghai Expat, Shanghai Family and City Weekend Parents & Kids is in limbo after an acquisition deal fell through last week. The four publications were put up for sale by Swiss parent company Ringier AG late last year. In November 2017, it was announced that Ocean Strategies, a Shanghai-based investment group managed by American entrepreneur Bromme Hampton Cole, had acquired the portfolio of media brands. As That’s Shanghai has learned from sources close to the situation, employees were notified via a company-wide WeChat group message on Friday, January 26 that negotiations to transfer ownership had failed. The decision affects nearly 30 employees in Shanghai, and staffers — a mix of local Chinese and expats — say they are in the dark as to whether or not their January salaries will be paid. Meanwhile, the websites and social media pages of all four brands have gone dormant, with nothing posted since last weekend. That’s Shanghai reached out to Ringier, who responded with a statement from Florent de Rocca-Serra, General Manager of the multinational publisher’s Asia operations. In basics, we signed a contract with [Cole] for the sale of Ringier China’s four English brands in November. [Cole] was given until January 15 to complete payment. When he failed to pay, he asked Ringier to renegotiate certain terms; these were not acceptable to us and as is our right, we asked to proceed with the original contract. To date, [Cole] has failed to fulfill his end of the contract. With [Ringier Africa and Asia CEO Robin Lingg’s] full support, Ringier is actively working on different solutions to resolve the situation, including through legal means. At this point there are no 100% clean solutions but we are doing our best to take care of the brands and everything our former employees helped build. We hope to keep the business alive and continuing as much as is practically possible. The statement added that an update would be coming later this week. That’s Shanghai has also reached out to Bromme Hampton Cole, Chairman and CEO of Ocean Strategies, who declined to comment. However, a source close to Cole told That’s Shanghai that Ringier's statement was essentially true, explaining that the incoming owners needed an entity that could stamp advertising contracts and issue advertising fapiao [receipts]. Without this, they would be unable to collect revenue, making the business nonviable. Cole is said to have proposed a number of solutions to this issue to Ringier, none of which they were amenable to, the source added, meaning there could be no deal. Meanwhile, City Weekend Beijing — which had been operated by another company since 2016 — appears to have terminated publication altogether, for both its online and print editions. “Farewell Beijing, we will miss you all,” read an article posted to City Weekend Beijing’s WeChat account on December 8, 2017. Cole also made his media aspirations known in a widely-shared interview with SmartShanghai. Despite an overall industry trend of declining revenue from print advertising, the brands each had a flourishing digital presence. Combined followers for their social media platforms numbered in the hundreds of thousands. City Weekend was one of the first privately-run English language media outlets to be established in China. Its first print edition launched in Beijing in 1999, followed by Shanghai in 2000. In addition to Shanghai Family and Parents & Kids, it has also produced regular supplements. In 2012, Ringier added Shanghai Expat, a popular website and forum founded in 1999, to its portfolio of China products. 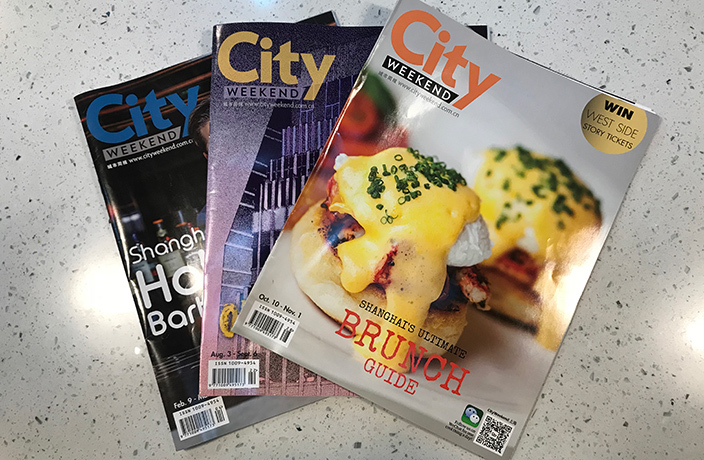 Originally a free bi-weekly magazine, City Weekend Shanghai switched to a monthly at the end of 2016, before finally shuttering the print edition altogether when the Ocean Strategies acquisition was announced. More on this developing story as we receive it. The 2019 Shanghai International Half Marathon will be held this Sunday. Residents of Lingang New City rejoice, as you will soon welcome another landmark to your region.